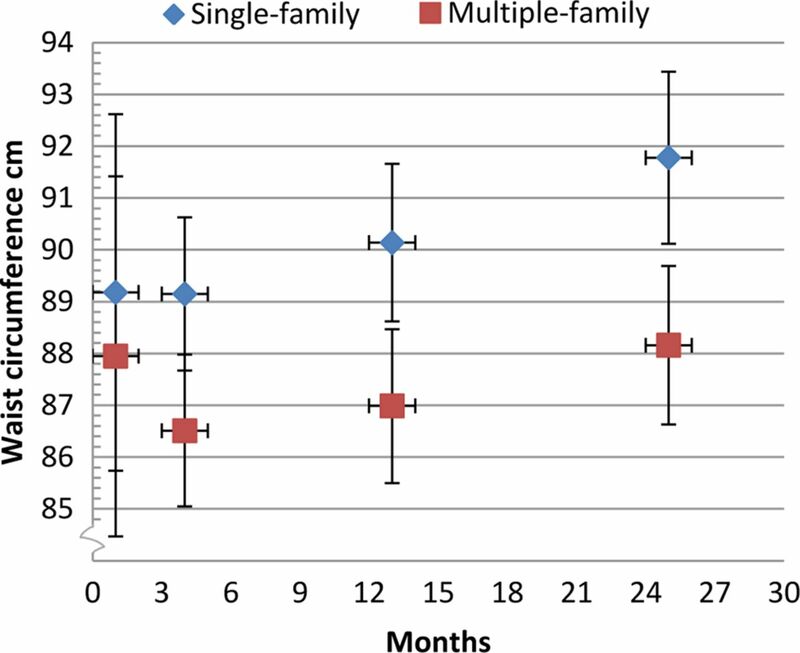 Objective To compare a comprehensive lifestyle intervention for overweight children performed in groups of families with a conventional single-family treatment. Two-year follow-up data on anthropometric and psychological outcome are presented. Design Overweight and obese children aged 6–12 years with body mass index (BMI) corresponding to ≥27.5 kg/m2 in adults were randomised to multiple-family (n=48) or single-family intervention (n=49) in a parallel design. Multiple-family intervention comprised an inpatient programme with other families and a multidisciplinary team, follow-up visits in their hometown, weekly physical activity and a family camp. Single-family intervention included counselling by paediatric nurse, paediatric consultant and nutritionist at the hospital and follow-up by a community public health nurse. Primary outcome measures were change in BMI kg/m2 and BMI SD score after 2 years. Results BMI increased by 1.29 kg/m2 in the multiple-family intervention compared with 2.02 kg/m2 in the single-family intervention (p=0.075). 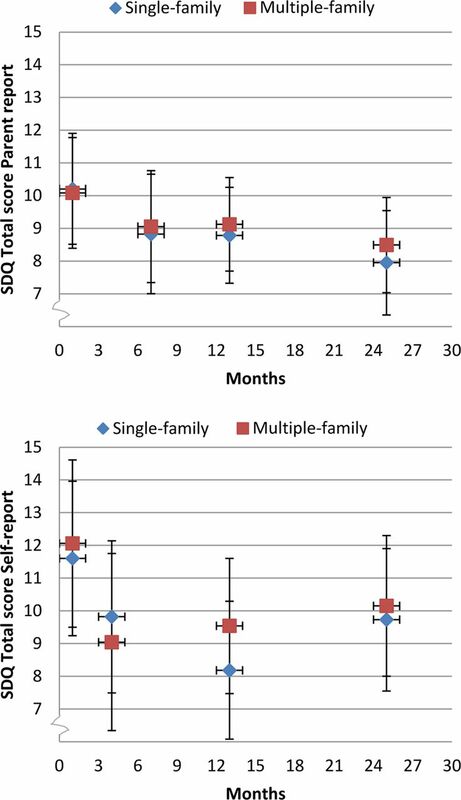 BMI SD score decreased by 0.20 units in the multiple-family group and 0.08 units in the single-family intervention group (p=0.046). A between-group difference of 2.4 cm in waist circumference (p=0.038) was detected. Pooled data from both treatment groups showed a significant decrease in BMI SD score of 0.14 units and a significant decrease in parent-reported and self-reported Strength and Difficulty Questionnaire total score of 1.9 units. Conclusions Two-year outcome showed no between-group difference in BMI. A small between-group effect in BMI SD score and waist circumference favouring multiple-family intervention was detected. Pooled data showed an overall improvement in psychological outcome measures and BMI SD score. Trial registration number NCT00872807, http://www.clinicaltrials.gov. Childhood obesity represents a threat to children's health, and comprehensive treatment programmes can reduce the level of overweight 1 year from baseline. There is a need for evidence of long-term effects of childhood obesity interventions to recommend cost-effective treatment strategies applicable for primary care. Psychological consequences of obesity can be evident at young age, but few intervention studies report on vital psychological outcomes. 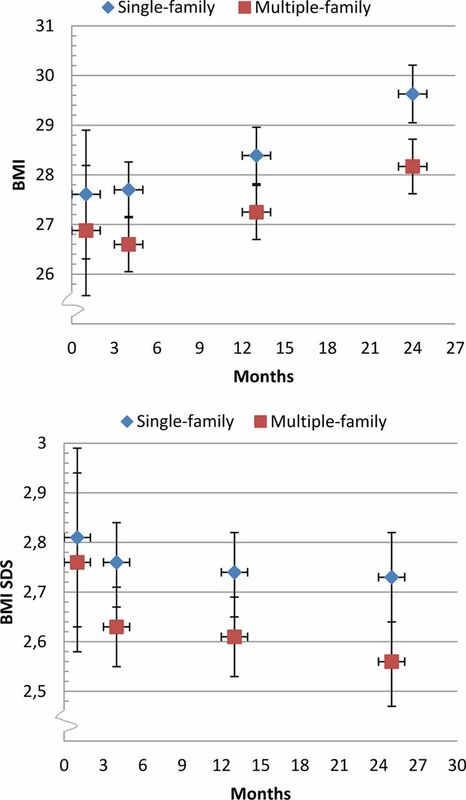 Two-year outcome of a comprehensive multiple-family intervention did not show any advantageous effects in BMI change compared with a more conventional single-family approach. A significant between-group effect in waist circumference in favour of the multiple-family approach was observed and needs further investigation. Pooled data showed significant improvement in overweight and psychological outcome measures after completion of two generally applicable programmes performed in shared care. Obesity is a considerable threat to children's physical and mental health.1 ,2 Family-based lifestyle programmes focusing on nutrition, physical activity and behavioural change can reduce the level of overweight.3–5 Data on effectiveness of treatment programmes beyond 1 year are however limited. There is little high-quality evidence to recommend one treatment over another, and cost-effective programmes applicable to primary care have been requested.3 ,5 ,6 There is further a lack of data on psychological outcomes in intervention studies,3 and this trial aims to address some of these shortcomings. The northernmost county of Norway, Finnmark, has a high prevalence of childhood obesity.15 Long travelling distances and limited hospital resources stimulated new treatment strategies for childhood obesity based on collaboration between specialised and primary health care, a shared care approach.16 Group-based management of childhood obesity may contribute to interaction between group facilitator and group members towards behavioural change and is considered cost effective.17 Group approach may also affect obese youngsters’ psychological health and is to our knowledge not well studied. The objective of the Finnmark Activity School trial was to compare a new comprehensive multidisciplinary approach comprising meeting with other families in groups (multiple family intervention (MUFI)) with a more conventional single-family intervention (SIFI) with respect to primary outcome parameters (body mass index (BMI) kg/m2 and BMI SD score) and secondary outcome parameters (anthropometrical, physical activity, metabolic and psychological measures) in a randomised controlled trial (RCT). Methods are fully described in a previous paper.16 This paper presents 24 months’ anthropometrical and psychological outcomes of two treatment programmes for childhood obesity. 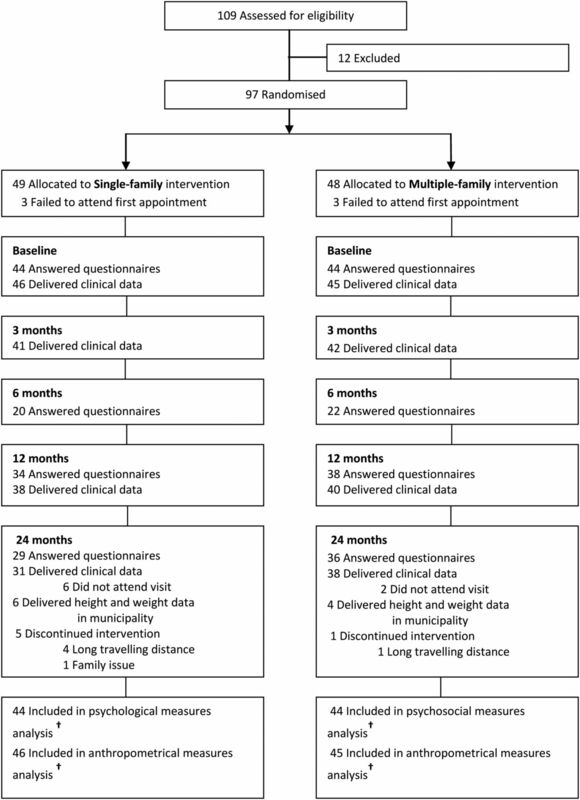 MUFI comprised a 3-day inpatient programme at the hospital with other families and a multidisciplinary team, individual and group-based follow-up visits in their hometown, weekly group-based physical activity and a 4-day family camp (table 1). SIFI comprised clinical examination and individual counselling by paediatric nurse, paediatric consultant, nutritionist at the hospital and follow-up by a local public health nurse. The study was powered to detect a between-group difference in mean change of 0.5 kg/m2 BMI with SD of 0.8 from baseline to 2 years with two-sided α-level of 0.05 and 80% power. Differences between intervention groups at baseline were assessed by two-sample t test and Pearson's χ2 tests. All data were analysed by the intention-to-treat principle. Linear mixed models27 were used to compare time trends in BMI kg/m2 (and secondary anthropometrical outcomes) between the two groups over four time points. The independent variables were group, time (as three indicator variables) and cross-product terms between each indicator variable of time with group. A significant group-by-time interaction indicated different time trends between the intervention groups. In secondary analyses, we adjusted for random differences at baseline. All analyses were performed using Stata V.12.1 (StataCorp 4905 Lakeway Drive College Station, Texas, USA). Two-sided p<0.05 was considered statistically significant. Figure 1 shows participant flow from recruitment to 24 months’ follow-up. Altogether 97 families were randomised and 91 children provided baseline data. Anthropometrical data after 24 months were collected from 69 children. Additionally, height/weight data from 10 children were reported from a local child healthcare centre, adding up to 81% retention for primary end points. No between-group differences in baseline variables were detected (table 2). Flow of participants* through 24 months of treatment: Finnmark Activity School. *Siblings are not included in the analysis. †Longitudinal analyses include all available data from every subject through withdrawal or study completion. Anthropometrical outcome data are summarised in table 3. At 2 years’ follow-up, BMI had increased by 1.29 kg/m2 in the MUFI group and by 2.02 kg/m2 in the SIFI group, p=0.075. Mean decrease in BMI SD score was 0.20 units in the MUFI group and 0.08 units in the SIFI group (p=0.046) (figure 2). Waist circumference increased by 0.21 cm in the MUFI group and 2.60 cm in the SIFI group (p=0.038) (figure 3). Adjustment for baseline values did not affect the results for BMI SD score or waist circumference. Except for a small between-group difference in skin fold after 3 months, no difference was observed for skin fold or body fat measured by bioelectrical impedance analysis. Pooled data from both treatment groups showed a significant decrease in BMI SD score of 0.14 units. Body mass index (BMI) kg/m2 and BMI SD score: Finnmark Activity School. Mean (95% CI) changes in body mass index and BMI SD score from baseline to 24 months’ follow-up by intervention group. Waist circumference: Finnmark Activity School. Mean (95% CI) changes in waist circumference from baseline to 24 months’ follow-up by intervention group. As shown in figure 4, there was no between-group difference in mental health as measured by SDQ from baseline to 24 months. However, pooled data from both intervention groups showed a significant decrease/improvement in parent-reported (n=89) and self-reported (n=66) total difficulty score of 1.9 units (95% KI −2.96 to −0.83, p=0.000 for parent, and 95% KI −3.41 to −0.37, p=0.015 for self-report) (see online supplementary tables A1 and A2, appendices), with significant improvement in the emotional symptoms and peer problem subscales (see online supplementary figures A1 and A2). Parent and self-reported mental health Strengths and Difficulties Questionnaire (SDQ) total score: Finnmark Activity School. Mean (95% CI) changes in SDQ total score from baseline to 24 months’ follow-up by intervention group. There was no difference in domain-specific and global self-worth subscales of self-perception between the two intervention groups (see online supplementary table A3). Pooled data from both intervention groups showed a significant improvement in athletic competence of 0.64 units (95% KI 0.48 to 0.80, p=0.000), social acceptance of 0.15 units (95% KI 0.02 to 0.29, p=0.029) and behavioural conduct of 0.16 units (95% KI 0.04 to 0.29, p=0.012) after 12 months. Notably though, only an increase in athletic competence of 0.5 units (95% KI 0.34 to 0.67, p=0.000) was sustained after 24 months (see online supplementary figure A3). The parent-reported and self-reported quality of life data showed no difference between the intervention groups at any time point (see online supplementary table A4). Pooled data showed a significant increase in self-reported total score after 12 months of 3.39 units (95% KI 0.34 to 6.43, p=0.029) but improvement waned after 24 months. There was no overall change in parent-reported and self-reported total score of quality of life from baseline to 24 months. Two-year follow-up data from this child obesity trial showed no between-group difference in terms of BMI kg/m2 or psychological outcome measures. A small between-group effect in BMI SD score and waist circumference in favour of the MUFI intervention was observed. Pooled data from both intervention groups showed a significant decrease in parent-reported and self-reported SDQ problem scale and an increase in self-reported athletic competence as well as an overall decrease in BMI SD score. Evidence of long-term effects in family-based treatment of childhood obesity was early observed by Epstein and colleagues.28 However, few recent randomised lifestyle interventions reported between-group difference in BMI or BMI SD score between new comprehensive approaches and control groups (conventional, self-help or no treatment),29 ,30 whereas other trials showed no between-group differences after 2 years.31 ,32 Authors evaluating obesity interventions have put forward social facilitation, increased contact and longer duration of treatment combined with a considerate reduction in adiposity during first months of intervention as approaches for improving long-term results.31 These elements are present in the current trial and might explain the modest between-group effects. Mean treatment effect in the MUFI group did not reach ≥0.25 BMI SD score reduction, which is necessary to improve cardiovascular risk factors in obese adolescents according to a British study.33 Waist circumference is considered a good marker of visceral adipose tissue in children and is associated with cardiovascular risk factors.34 A significant between-group difference in waist circumference as seen in this trial may indicate a favourable development in risk profile. On the other hand, the small improvement in the SIFI group (−0.08 in BMI SD score) in spite of very few hours of contact (8 h first year and 2.5 h second year) is interesting, and we might speculate that the shared care approach in both treatment arms based on collaboration between primary and specialised care has contributed to this finding. There were no between-group effects in measures of mental health and well-being in the current study. Two obesity trials involving group interventions with children and adolescents reported on improvement in self-esteem and quality of life in the intervention group compared with control.36 ,37 To the best of our knowledge, psychological outcomes in other group-based trials addressing childhood obesity are lacking. Only a few child obesity trials reported on mental health outcome while some studies reported on self-esteem and quality of life.36 ,37 An overall improvement in these parameters post-treatment was observed in most studies, but long-term effects beyond 1 year are lacking. We applied principles from solution-focused brief method, with non-claiming/neutral therapeutic position, assumptions of motivation and focus on solutions beyond problems.22 This may have contributed to improved provider/family interaction, stronger retention and favourable anthropometrical and psychological long-term results in both treatment groups. Beneficial psychosocial effect of physical activity is thoroughly documented.39 Provided that the participating children managed to increase their activity levels, this favourable change may have affected their mental health and well-being. The self-reported improvement in athletic competence could imply such a mechanism. Strengths of this study include the randomised design, blinding of the primary outcome assessors, sample size determined from power calculation achieved, appropriate statistical methods including intention-to-treat analysis and linear mixed models applied, moderate withdrawal and reporting according to CONSORT guidelines. In addition, an appropriate pilot study was performed. Performing a clinical trial in small municipalities is challenging because of high risk of contamination between treatment groups. SIFI and MUFI appointments were scheduled at different days to minimise contact between groups, but causal meetings between families were inevitable. Due to the small municipalities and shortage of personnel, the same providers were employed in both treatment arms. As a consequence, the outreached guidance and courses for providers reached the SIFI as well as the MUFI groups. This strategy might have attenuated group differences. In order to assess the natural course of adiposity and psychological outcome in obese children, a true control group would be optimal. However, it is for ethical reasons impossible in long-term studies to randomise obese children to ‘no intervention’ or a waiting list. The modest difference between the two treatment groups after 2 years raises the question whether the cost of the MUFI approach can be justified. The between-group effect in waist circumference and effect on cardiovascular risk factors need further investigation. The overall significant decrease in BMI SD score in both groups suggests that increased awareness and minimal support is sufficient to succeed with lifestyle changes for some families. Future studies should examine subgroup effects. Obesity interventions in children and adolescents should examine health in broad perspective and evaluate mental health and well-being in addition to other health outcomes. The current shared care model can be applicable to other regions and settings. Two-year results from this trial showed no between-group difference for BMI or psychological outcomes. There was a significant between-group difference in waist circumference in favour of the MUFI approach. Pooled results from both treatment arms showed a significant improvement in parent-reported and self-reported mental health combined with a significant decrease in BMI SD score of 0.14. We thank all the participating families, and primary and secondary health care personnel involved in the Finnmark Activity School trial. We also want to thank the families participating in the pilot project, Professor Lars Bo Andersen, University of Southern Denmark, Professor John A Rønning, University of Tromsø, participants in the early Activity School Reference Group, representatives from Finnmark County Authority, County Governor of Finnmark and Finnmark Sport Council, who all contributed with valuable support in the development of this project. We also thank Professor Tom Wilsgaard for advice and quality assurance of the statistical analysis.
. Mental health, wellness, and childhood overweight/obesity. J Obes 2012;2012:281801.
. Interventions for treating obesity in children. Cochrane Database Syst Rev 2009;(1):CD001872.
. Obesity in children. Clin Evid (Online) 2011;2011:pii:0325.
. Mental disorders in obese children and adolescents. Psychosom Med 2004;66:387–94.
. Psychiatric comorbidity of childhood obesity. Int Rev Psychiatry 2012;24:241–6.
. Self-esteem and quality of life in obese children and adolescents: a systematic review. Int J Pediatr Obes 2010;5:282–304.
. Quality of life in a clinical sample of obese children. Int J Obes (Lond) 2007;31:39–44.
. Health-related quality of life of severely obese children and adolescents. JAMA 2003;289:1813–19.
. The impact of obesity on psychological well-being. Best Pract Res Clin Endocrinol Metab 2005;19:421–40.
. Psychological consequences of obesity: weight bias and body image in overweight and obese youth. Int Rev Psychiatry 2012;24:247–53.
. Parents’ journey through treatment for their child's obesity: a qualitative study. Arch Dis Child 2008;93:35–9.
. High prevalence of overweight and obesity among 6-year-old children in Finnmark County, North Norway. Acta Paediatr 2012;101:924–8.
. Single versus multiple-family intervention in childhood overweight—Finnmark Activity School: a randomised trial. Arch Dis Child 2014;99:225–31.
. The Strengths and Difficulties Self-Report Questionnaire as a screening instrument in Norwegian community samples. Eur Child Adolesc Psychiatry 2004;13:73–82.
. Harter's Self-Perception Profile for Adolescents: reliability, validity, and evaluation of the question format. J Pers Assess 1995;65:100–16.
. Quality of Life as reported by school children and their parents: a cross-sectional survey. Health Qual Life Outcomes 2008;6:34.
. Ten-year outcomes of behavioral family-based treatment for childhood obesity. Health Psychol 1994;13:373–83.
. A two year family based behaviour treatment for obese children. Arch Dis Child 2005;90:1235–8.
. A randomised study on the effectiveness of therapist-led v. self-help parental intervention for treating childhood obesity. Br J Nutr 2013;110:1143–50.
. What reduction in BMI SDS is required in obese adolescents to improve body composition and cardiometabolic health? Arch Dis Child 2010;95:256–1.
. Body fat measurements in children as predictors for the metabolic syndrome: focus on waist circumference. Proc Nutr Soc 2006; 65:385–92.
. Effect of the Go4it multidisciplinary group treatment for obese adolescents on health related quality of life: a randomised controlled trial. BMC Public Health 2013;13:939.
. A systematic review of the psychological and social benefits of participation in sport for children and adolescents: informing development of a conceptual model of health through sport. Int J Behav Nutr Phys Act 2013;10:98.
. What is the best measure of adiposity change in growing children: BMI, BMI %, BMI z-score or BMI centile? Eur J Clin Nutr 2005;59:419–25. Contributors AK designed the study, conducted the study, analysed and interpreted the data and wrote the original manuscript. SG designed the study, involved in conducting the study, data interpretation and edited the manuscript. SS analysed psychological outcome measures, interpreted data and edited the manuscript. TF designed the study and was involved in conducting the study, data interpretation and edited the manuscript. IN designed the study and was involved in conducting the study, interpretation of data and editing the manuscript in addition to statistical advices. All authors have read and approved the final manuscript. Ethics approval Regional Committee for Medical and Health Research Ethics, Region North. The families gave written informed consent signed by parents and all children ≥12 years.